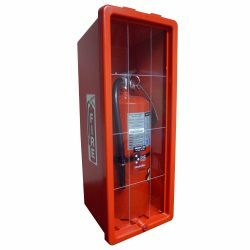 The Fire Extinguisher & Cabinet (FE-20) includes a 20 lb (9 kg) capacity, Type ABC fire extinguisher and a front-loading cabinet. This multipurpose fire extinguisher is designed for use in combating nearly any fire risk from Class A (trash, wood, and paper), Class B (liquids and gases), and Class C (electrical fires). The cabinet is for indoor or outdoor use and protects the extinguisher from dirt, debris, water, and chemicals.